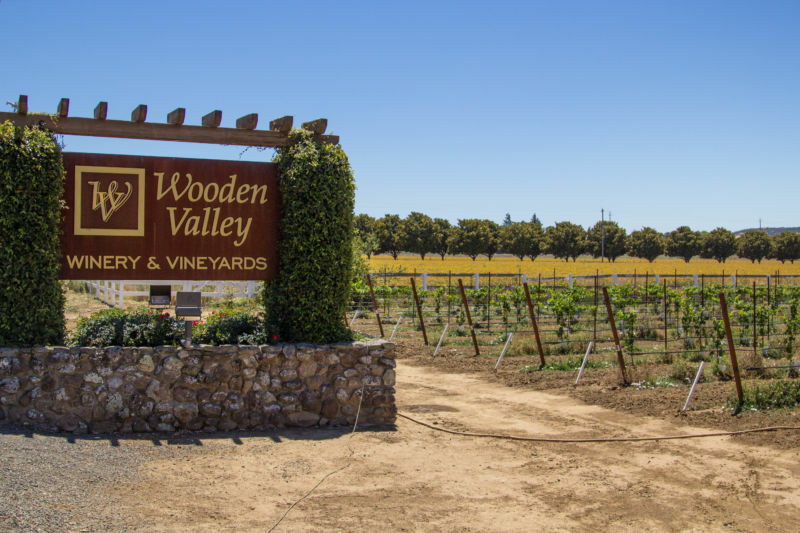 The Brit and I recently revisited Wooden Valley Winery in the Suisun Valley. Suisun Valley is over the hill from Napa. 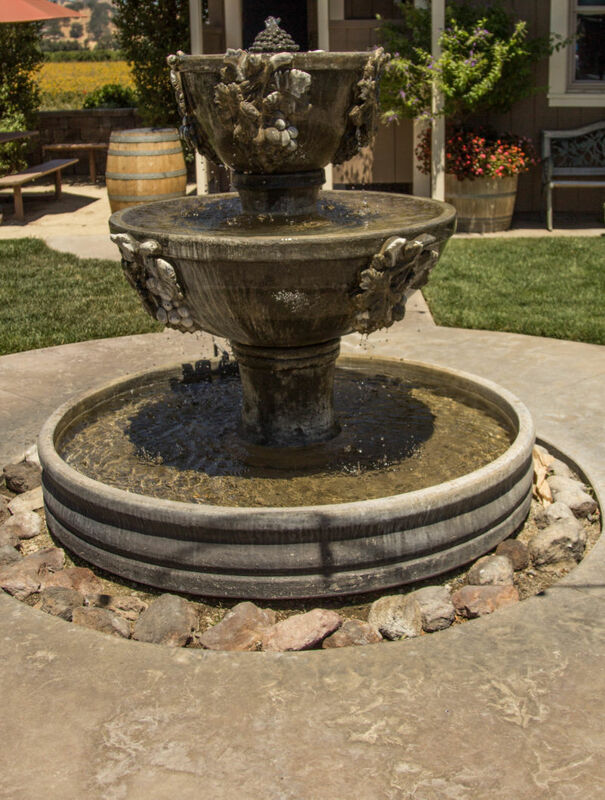 There are several fine and up and coming wineries there to explore and enjoy. 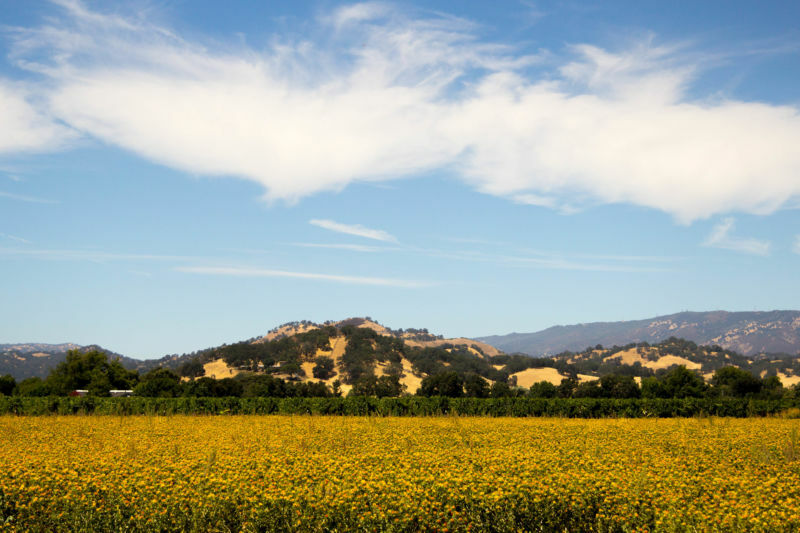 It is easy to access from both I-80 and I-680 freeways, and the wineries are a lot less crowded than those in Napa and Sonoma. The tasting fees and the wines are by in large more affordable too. Wooden Valley Winery has a pretty little tasting room that is well-appointed and staffed with friendly, efficient people. They have a huge range from sweet wines to hearty Cabs. They even have some sparkling wines which I have yet to try. I have to give a shout out to Anna in the tasting room who was a wonderful and very helpful ambassador for this winery. She’s awesome and if you visit on the weekends, ask for her by name. We attended to two events there: The Wine and Song Sunday; a relaxing afternoon with wines from Wooden Valley, catering from CrossRoads Kitchen, and a fun old-timers band. Admission was free. The food truck was about $8 per meal. You can’t beat that! The weather was gorgeous, and we sat out in the sunshine and tried some of their wine. The second event was far more exciting. On the third Friday of the month they have “Food Truck Fridays”. Here they have a large selection of food trucks, music, and of course their wine. Again, the event is free, you just buy your wine and your food. The food trucks are varied and are all of great quality. The other thing about this event is that they are raising money for our wounded soldiers via the Wounded Warriors Project. This event will continue all the way through October so you have plenty of time to check it out. Cava Gourmet Funnel Cakes – I don’t recommend this vendor. I ordered Iced Tea which was absolutely undrinkable. They didn’t even fill it three-quarters full and they charged me $2.00! Since entree’s were running around $8.00 and bottles of water were $1.00, I felt that I was totally ripped off! I ended up throwing the offending iced tea away . On the other side of the scale, I have to tell you that I like CrossRoad Kitchen. 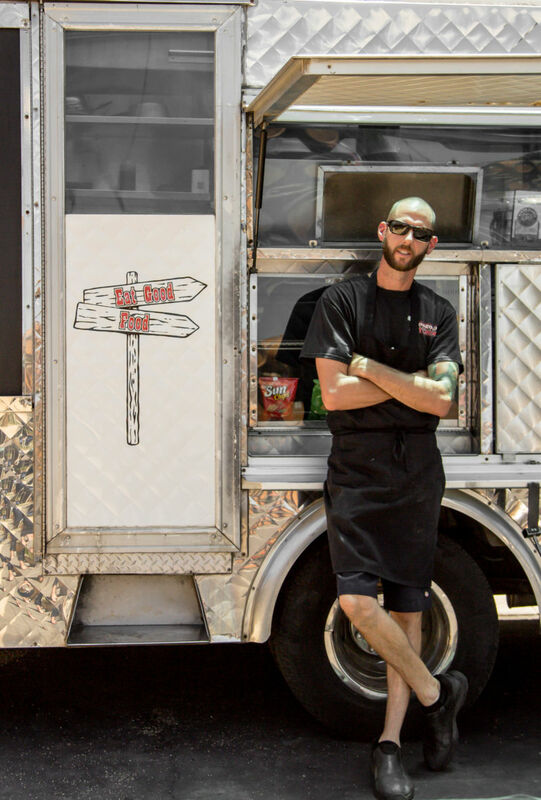 I have eaten from that truck a couple of times and have been very impressed with the quality of the food and the owner Colin. He’s a very friendly and warm guy and I like how he uses locally sourced products, while keeping the prices at a more than reasonable level. The pork loin sandwich is delicious; I love the pairing with mustard aioli. It is tender and juicy with lots of flavor. 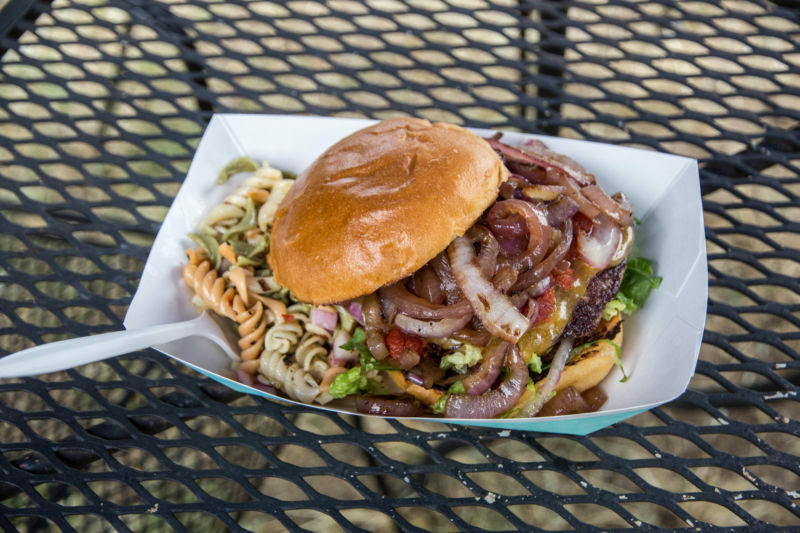 The burger that I ate was beautifully cooked with fresh tasting ingredients. Let’s give Colin a big cheer for his chicken sandwich with chipotle sauce. The chicken was perfectly cooked. You all know how I hate overcooked chicken. The chipotle sauce had a great flavor, without being too spicy. 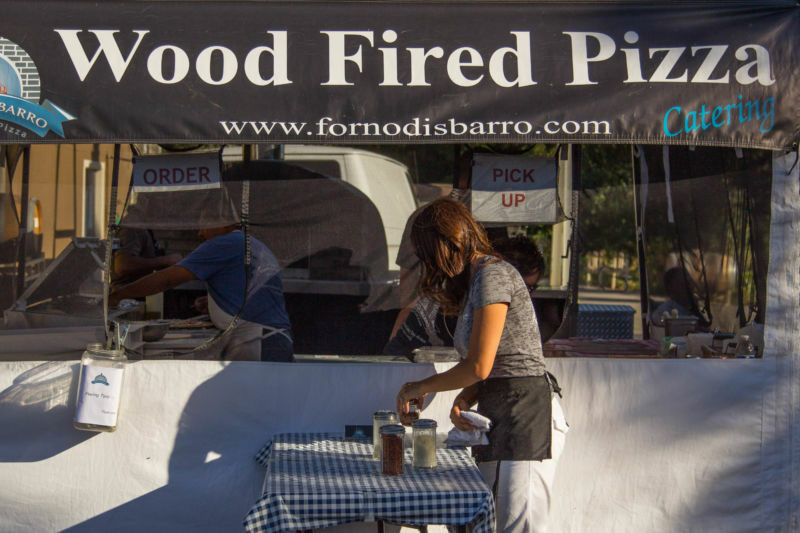 Forno di Sabarro Wood Fired Pizza is another favorite. I first enjoyed their pizza at a party thrown by a couple of our friends. It is super hard to impress me with any Italian food, but this guy really has it nailed to perfection. It is a good thing he doesn’t have a local pizza company that I could go to daily or I would never fit into my clothes (I think he does serve locally at various locations but I am trying not to know where they are). 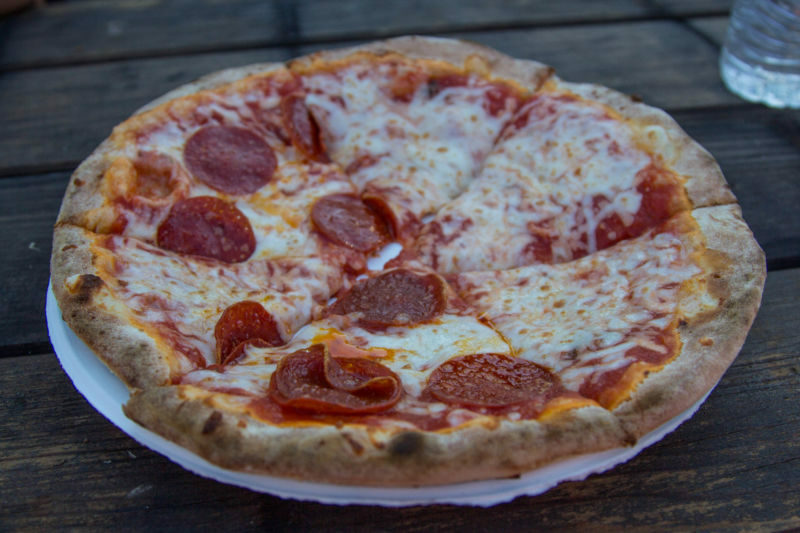 The pizza is a thin crust which was light and fluffy, perfectly cooked, with delicious toppings. The wood fired taste brings it over the top for me. We just discovered a wonderful new vendor who our entire group of foodies and wine drinkers gave the big thumbs up to; Magpies Bakery and Catering. I have mentioned on this blog before that I cook and bake. I am known for my baked goods among our family and friends, so rarely am I impressed. Magpies Bakery has amazing treats. 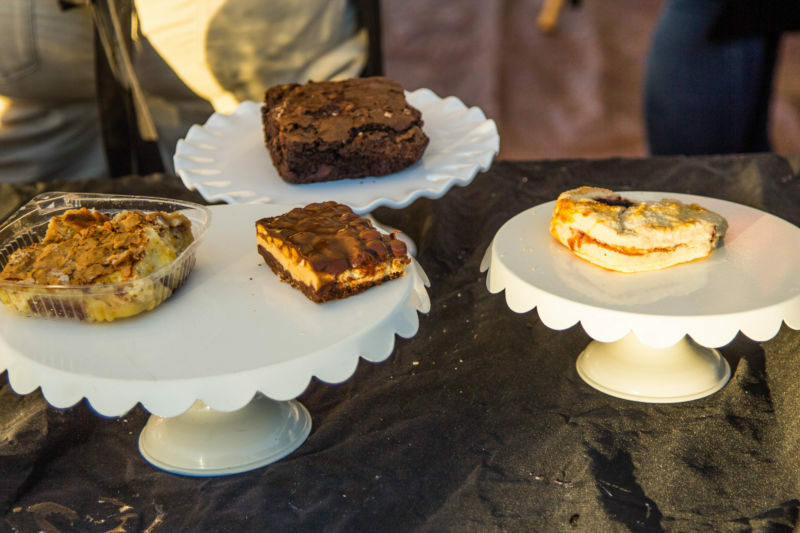 Our favorite was a toss-up between the brownie a la mode and the Peanut Butter crisp candy bar. The brownie was quite cakey in texture, moist and tender. 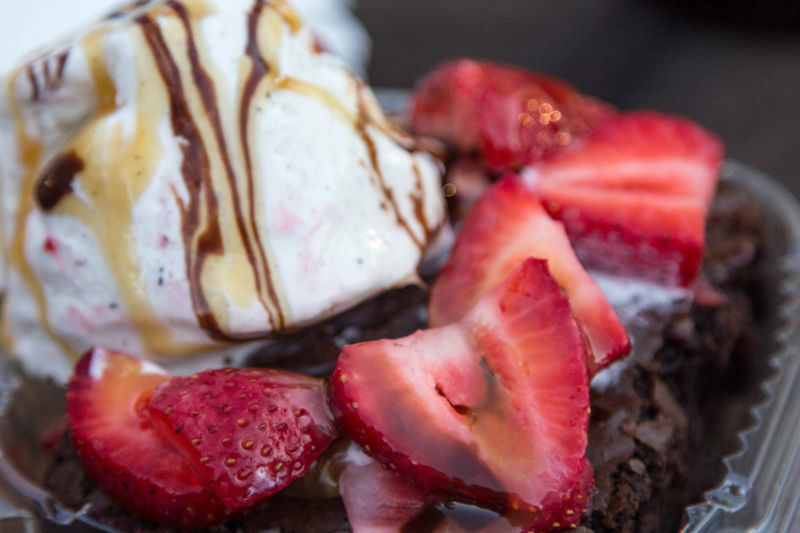 It was served with fresh strawberries, homemade vanilla bean ice cream, and topped with both caramel & chocolate syrups. That was good, but I was wowed by the Peanut Butter crisp candy bar. There were layers to the bar; the bottom was chocolate and rice crispies. The middle layer was a gorgeous peanut butter mousse with real peanuts. The top layer was a dark chocolate ganache. Trust me here, it was really outstanding!! The Brit comments: Whilst the brownie was good and its a la mode component excellent, it was the salt lick that was my favourite. 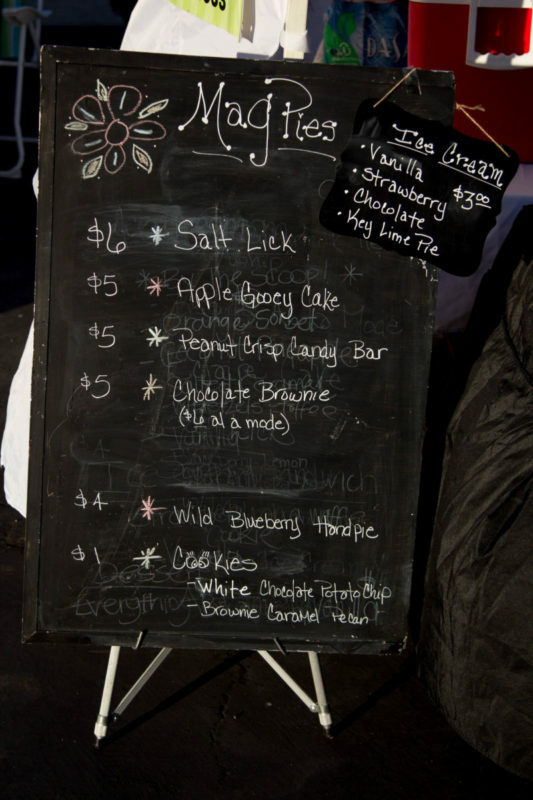 I had never tried a salt lick before; it was a pastry cup with salted chocolate on what, I think, was a condensed milk filling. It may not sound especially appealing, but the balance of sweet and salt and the combination of textures made this delicious and very unusual. Because The Brit and I went to these two events, we have yet to do a regular tasting. We have bought a couple of bottles of their wine and sat out and drank them. We shall do an in-depth posting on them with full tasting notes at a later date. At the events you can purchase either a bottle or a glass. The glasses are $6.00. We purchased the 2014 Merlot. At $21 a bottle, this was both affordable and very drinkable. A well-balanced blend of flavor on the palate included vanilla, plums, cherries, and very soft tannins. I was happy drinking this wine as we sat enjoying the music. Our wine group of friends all bought bottles of the Merlot and everyone agreed that it was very drinkable. I won’t tell you how many bottles we went through that night, but a good time was had by all. I bought one of our guests a glass of the White Gamay; a very light, sweet, rosé. If you like wines on the sweeter side, this one is for you. It is fruity and slightly floral. At $14 a bottle it’s a good value. The Brit comments: At the Sunday event, I also tried a glass of their 2014 Zinfandel. It was not a Napa style Zin, with jammy fruitiness, but a more subdued blend of dark summer fruits and earthiness. At $22 a bottle, it is a pleasing and well-priced drink. Trying to choose the wine for the bottle I first tasted their Sangiovese. It isn’t on their website’s tasting menu, so I am wondering if it is a new release. I have to say that it wasn’t to my taste and I did a pour out on that one. Maybe it was too young? Maybe I just have a lot to compare it to as Sangiovese is one of my favorite varietals. I will come back to this one and let you know. The next Food Truck Friday will be held on August 26th. The events go from 4 pm until 8 pm. 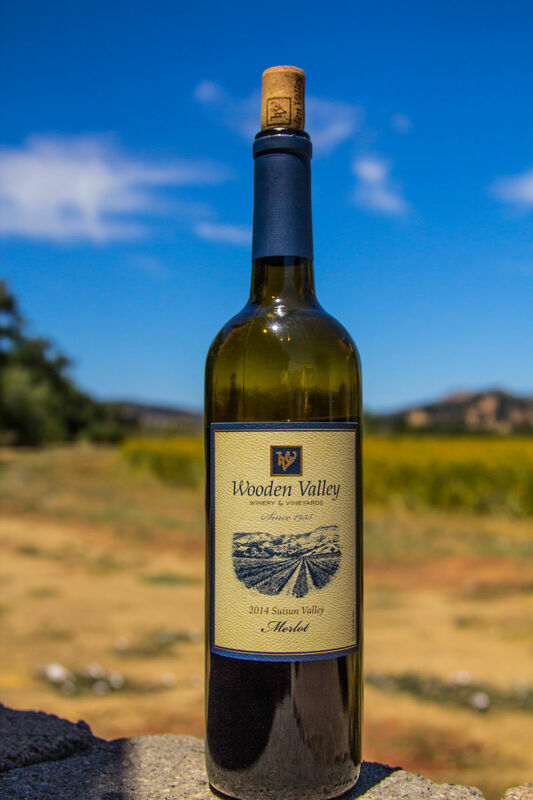 You can find more details about all of their events at Wooden Valley Winery Events. Remember its all free to go, and it benefits a very worthy cause The Wounded Warrior Project. Hope to see you all there! Pacific Blues Cafe, Yountville – made us see red!